This level has medium difficulty. 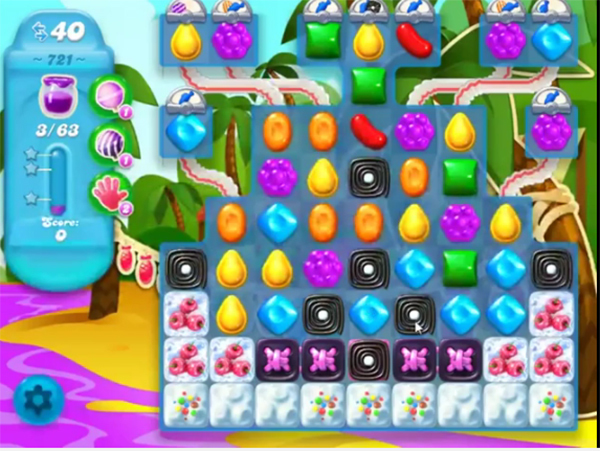 For this level try to play more from the bottom to shuffle the candies as it will help to get the special candy. Or play near to blockers to break them to spread the jam or combine special candy with each other to spread the Jam. I am amazed at how easily this level was done, it seems to take at least 5 strikes to remove the bottom row. I’ve never had those combinations either.??? HaHaHaHa…Talk about easy. Been playing every day for weeks and the most I ever achieved even with 3 boosters was 59 out of 63. The game cheats all the time wiping out the best moves that appear for no obvious reason, running strikes upward every time across would be beneficial and sending fish to hit pointless out of the main stream tiles. It’s ludicrous and I’m swearing off permanently. Don’t need the aggravation. I can’t open this level. What can i do to fix it? It says reward 5 of 5 i hit it and it just keeps coming up. I would li e to play this level. Please help. This level will not load. I keep getting a pop up that says reward 5 of 5 I hit it and it just keeps popping up. Please help.